SEWARD — A year ago in his debut on Mount Marathon, Scott Patterson eased down that severely pitched slope overlooking Resurrection Bay out of necessity — he tweaked an ankle so often early on the descent that he picked prudence over performance and finished fourth. Tuesday, Patterson eased down the mountain because there was no need to rush. 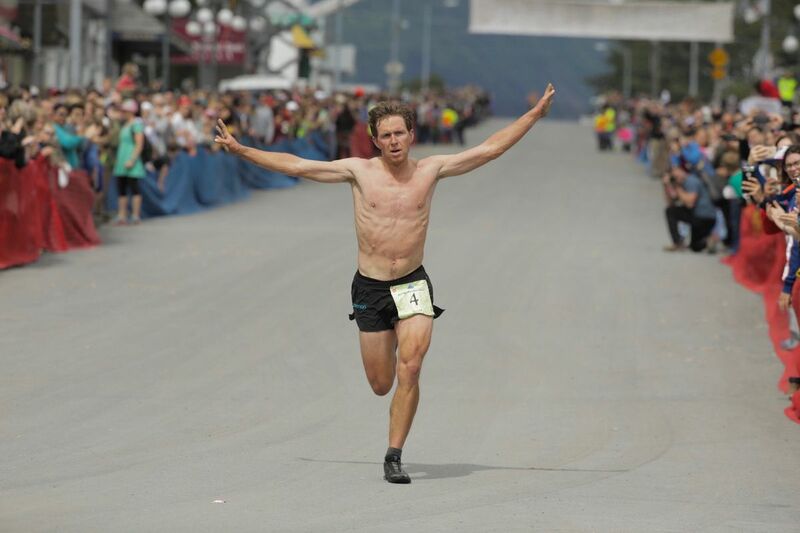 The 25-year-old from Anchorage destroyed the men's field lickety-split, turned the 90th running of the race into a blowout and seized his first title in Alaska's most celebrated footrace. Patterson is a nordic skier with Olympic ambitions for 2018. His race plan: Trounce the competition on the withering uphill that averages 34 degrees and safely negotiate the downhill to avoid injury that could potentially derail his ski training. Done, and done. Patterson clocked 44 minutes, 30 seconds, for the roughly 3-mile race to top runner-up Erik Johnson of Seward by 52 seconds and third-place finisher Kenneth Brewer of Chugiak by 2:23. Patterson raised his arms as he approached the finish line downtown and alternately tilted his shoulders, mimicking an airplane in flight. All his rivals saw most of the race was his figurative vapor trail. Patterson forged a lead of 2:16 over Johnson at the giant boulder that marks the race's summit turnaround point. That dominance drained the race of any drama and allowed him to cruise the downhill in 12:50, only the 26th-fastest descent on record. The national-champion skier said winning the race that's an annual Independence Day spectacle was the biggest running victory of his life. Mount Marathon draws thousands of fans, who line Fourth Street four-deep near the finish and hike onto the mountain to watch racers grind up that slab of pain before rocketing down it. Patterson entered Tuesday the prohibitive favorite after victories at Government Peak and Bird Ridge, a pair of uphill-only mountain races. David Norris, the defending champion and race record-holder (41:26), who is Patterson's teammate on the Alaska Pacific University nordic team and also harbors Olympic ambitions, skipped the race after suffering knee irritation last month. Nick Elson, the 2016 runner-up from British Columbia, also was absent after falling sick recently. From the outset, Patterson lived up to his pre-race billing. After racers made the short journey from downtown to the mountain's base, Patterson immediately gapped the field on the brush- and tree-covered bottom half of the mountain and continued to stretch his advantage. He power-hiked quickly and occasionally mixed in some running. Johnson said it wasn't until the highest stretches on the mountain that he caught a glimpse of Patterson. Johnson, 40, was no slouch. His 45:22 delivered a personal-best by one second, a performance he credited to strong training and losing 10 pounds this spring while volunteering at a farm in Maui for 10 weeks. Johnson's runner-up finish topped his previous best, a pair of eighth-places. Third-place finisher Brewer, 24, also earned his best Mount Marathon placing in his third go-round — he's debuted in 11th in 2015 and was eighth last year. He too marveled at Patterson's dominance. "I could not be more stoked to lose to that guy,'' Brewer said. UAF runner-nordic skier Alexander Eckert of Germany finished fourth in his Mount Marathon debut, clocking 47:18. Matthias Messner of Colorado finished fifth in his race debut in 47:32. Patterson said he knows he can run Mount Marathon faster, particularly with stiff competition in a non-Olympic year. No Olympics loom next summer, so 2018 sounds like a date.